Save the date. 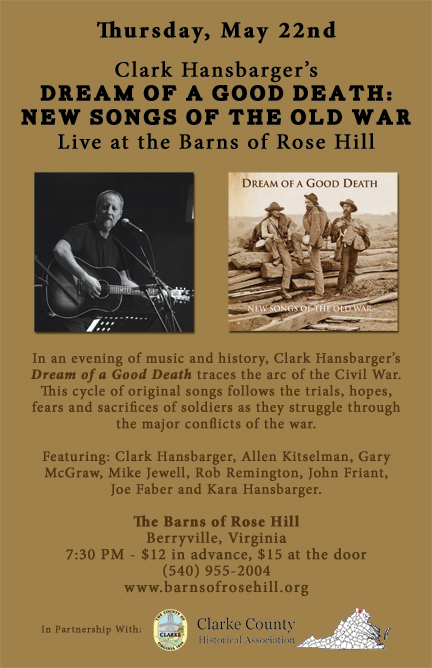 The Bitter Liberals will perform Clark Hansbarger’s Civil War CD Dream of a Good Death live at the Barns of Rose Hill in Berryvill, VA THURSDAY May 22. We’re proud to be associated with this fine piece of work. Come join us for a concert and some history. While you’re there, pick up a copy of the CD. This entry was posted in band, bitter liberals, CD, gig, original music and tagged barns of rose hill, berryville, bitter liberals, civil war, civil war CD, Clark Hansbarger, concert, dream of a good death, entertainment. Bookmark the permalink.